For each specified ASAP2 file a document is created displaying the ASAP2 hierarchy in a tree, the original content and the received ASAP2 parser messages in a data table. After selecting a specific ASAP2 object in the tree, the property grid below the tree displays properties corresponding to the selected ASAP2 object. Use the tree view to select your ASAP2 object. Open the search window with the CTRL+F shortcut to open the object search window. Selecting an object in the search window synchronizes the tree view and A2L content. Select a position in the A2L content manually. Synchronize the tree and property view by a double-click or the context menu to the selected position. You may change properties of selected ASAP2 objects in the ASAP2 object properties window. After changing ASAP2 object properties, ensure to save and reload the A2L file by using the 'File|Save' command to activate the changed properties. I recommend to never override the original A2L file! The ASAP2Demo application tries to load a suitable calibration (HEX/S19) data file anytime a A2L file is opened. Falls eine gleichnamige Datei im selben Verzeichnis gefunden wird, wird diese automatisch geladen, ansonsten wird die erste im selben Verzeichnis gefundene Datei geladen. To ensure loading the desired data file automatically, it is recommended to put the A2L and its data file into a standalone directory. You can load a calibration data file by the [File|Load data file] menu command. You may save a changed calibration data file by using its context menu [Save file] command. A TextBox control displays A2L ASCII value types. 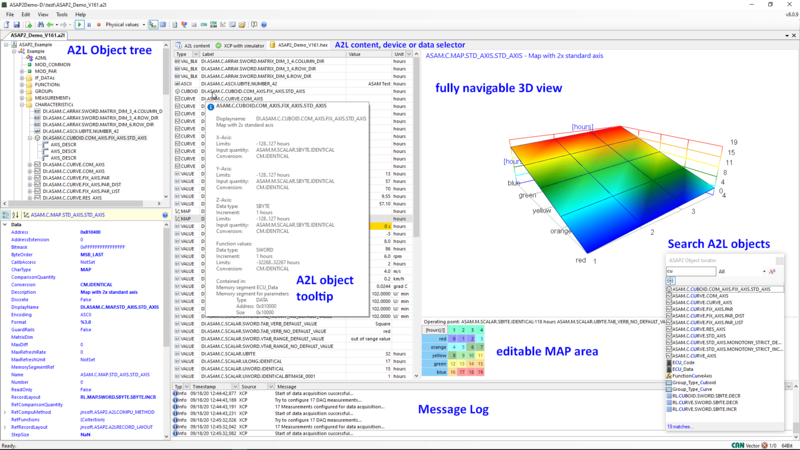 A 3D-Control displays the values for A2L value block, curve and map characteristic types. Use the mouse and the 3D-control's context menu to adjust perspective, zoom and view. Numeric characteristic values are adjustable by context menu [Edit value...] or just start typing a new value on the keyboard. For characteristic values containing multiple values (value block, curve, map) a cell selection within the displayed data has to be done before adjusting with the '+/-' keys. The minimum increment/decrement value for a characteristic depends on the A2L defined data type and format. Use the context menu of the calibration page to export or import calibration data as INCA DCM, CDF or MATLAB-m file format. If no A2L file is opened before the ELF File demo window displays only the ELF file analysis tabs. ASAP2Demo only allows the updated A2L file to be saved with a licensed version, see ASAP2Demo licensing. For an example of how to do an A2L address update with the ASAP2Library see the ELF example. You are asked to connect to the 'real' ECU or simulate the ECU using the ECU simulator. The philosophy of ASAP2Demo/ASAP2Library is to remain independent of specific CAN hardware. 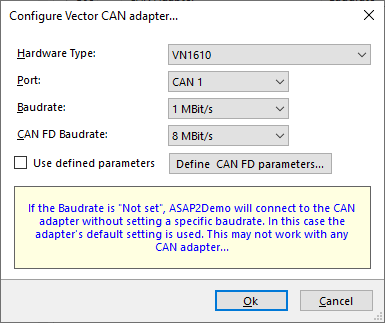 The ASAP2Demo installer does not provide drivers for CAN hardware, but uses only CAN hardware drivers installed on the target system. Depending on the CAN Hardware driver, ASAP2Demo searches the '%SYSTEMROOT%\system32' directory for a driver DLL. Manufacturer-specific information can be found in the following list of supported CAN hardware. Using the ECUSimulator on the same machine, the hardware type must be set to 'Virtual'. The XCP and CCP DAQ selection pages displays available DAQ lists and connected DAQ events. The page allows to enable or disable each single DAQ List to be used in online measuring. The ECUSimulator is implemented as a standalone console application (ECUSimulator.exe in the ASAP2Demo installation directory). The ECUSimulator may be started on any machine supporting the .NET Framework. Multiple instances of the ECUSimulator may be started on different IP ports on the same machine. Instances of the ECUSimulator on the local machine are connected, started and stopped automatically by ASAP2Demo. Never ever run more than one instance of ASAP2Demo with the same A2L in simulating mode! This leads to multiple XCP/CCP Master access on a single Slave. The behavior is not predictable in this case. Open a console window in the ASAP2Demo installation folder. The result is an ECUSimulator process supporting the specified protocol. The process simulates an ECU defined in the ASAP2Example.a2l with calibration data from ASAP2Example.hex. This paragraph is only of interest if ASAP2Demo is installed on a 64 Bit OS, but usually this is the default in these days. As the ASAP2Demo/ECUSimulator starts in this case in 64 Bit mode, using 32 Bit CAN drivers (the National Instruments CAN driver only supports 32 Bit applications) or using a 32 Bit Seed&Key DLL to get CCP/XCP/UDS access on ECUs will fail. The shortcut 'Force to run as 32Bit Process' in the ASAP2Demo folder forces an ASAP2Demo/ECUSimulator process to start always in 32 Bit mode. This only needs to be done after ASAP2Demo has been installed or upgraded to a newer version. Executing the shortcut requires administrator privileges. Before executing the link, ASAP2Demo/ECUSimulator running processes must be stopped.